An asterism is just a pattern of stars that grabs someone’s attention. Asterisms differ from constellations in that they don’t have any official standing, although some like the Big Dipper (which is only part of the constellation Ursa Major) are better known than their host constellations and have been recognized for far longer. Since asterisms don’t have to meet anyone’s standards for asterism-hood, anyone can point one out, and stargazers have been discovering them for as long as humans have watched the skies. I noticed this one for the first time a few weeks ago when I was hunting down NGC 2281 with my 15×70 binoculars. 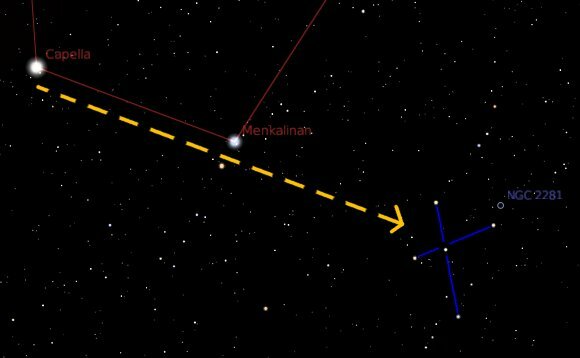 It’s an easy catch–just find Capella, trace a line to Menkalinan the next star counter-clockwise in the ring of stars that marks the constellation Auriga, and extend the line an equal distance in the same direction. Might as well take in NGC 2281 while you’re there–it’s just southwest of the right arm of the cross. NGC 2281 is a nice little open cluster for either telescopes or binoculars–another glittering diamond in the celestial Ring of Fire. But in this case, I like the asterism better than the cluster! It’s well worth seeking out, and definitely better in binoculars than in telescopes. The cross asterism seems really obvious, but I haven’t found any other mentions of it so far. Does anyone know if it has been noted or discussed before? I’ll be grateful for any info. You are currently browsing the 10 Minute Astronomy blog archives for the day Thursday, March 4th, 2010.